Sandy Lake First Nation (or Negaw-zaaga'igani Nitam-Anishinaabe, Oji-Cree: ᓀᑲᐤ ᕊᑲᐃᑲᓂᐣ᙮) is an independent Oji-Cree First Nations band government. 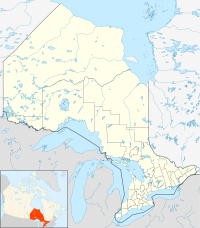 The First Nations community, in the west part of Northern Ontario, is located in the Kenora District, 227 km (141 mi) northeast of Red Lake, Ontario. Its registered population in June 2007 was 2,474. As of December 2015 the total registered population reached 3,034. Sandy Lake First Nation maintains an affiliation with Nishnawbe Aski Nation, as a signatory to the Treaty 5. Sandy Lake is policed by the Nishnawbe-Aski Police Service, an Aboriginal-based service. Robert Fiddler, Sucker clan leader and chief of Deer and Sandy Lake Bands at time of treaties. Sandy Lake is serviced by a Northern Store owned by the North West Company Inc. The community is a fly-in community, serviced by Wasaya, Superior and Perimeter Airlines, and is linked to the rest of the province by a winter ice road that travels southwest towards Deer Lake and Pikangikum, meeting Red Lake via the Nungesser Road, which is open for approximately six weeks during the winter months. Sandy Lake's education is maintained by the Sandy Lake Board of Education, and is serviced by three schools: Thomas Fiddler Memorial Elementary School, Thomas Fiddler Memorial High School, and Washtennigun Christian School. There is also an operational Adult Learning Center, with ties to Confederation College and Lakehead University. Five doodem are found at Sandy Lake First Nation; these five clans are the: Suckers, Pelicans, Crane, Caribou and Sturgeon. The Sandy Lake First Nation speaks the Oji-Cree language and uses the western Ojibwe Syllabics. The Sandy Lake First Nation governed by an elected Chief, a Deputy Chief and (8) eight councillors. The current Chief is Delores Kakegamic, and the Deputy Chief is Marcel Linklater. The Head Councillor is Wayne Kakepetum; the other seven Councillors are John McKay, Allan Rae, Fabian Crowe, Russell Kakepetum, Dennis Kakegamic, Yvonne- Fiddler Kakekagumick, and Darren Meekis. In addition to the Governance Council, the Sandy Lake First Nation maintains an Elder Council to advise the Governance Council. Working with the Governance Council, six boards carry out the Council's operations: Community Development Services, Education, Health, Housing, Radio Station, and Recreation. Sandy Lake Airport serves the community. Sandy Lake also has the ice/winter road during the winter months for people to drive in and out of the community. It starts at the end of Nungesser Road, goes through North Spirit Lake FN and next is the junction where the road splits into two, one going to Deer Lake FN and the other coming to Sandy Lake FN. ^ a b "Sandy Lake 88 census profile". 2011 Census of Population. Statistics Canada. Retrieved 20 June 2015. First Nation Connectivity Profile for Sandy Lake First Nation. This page was last edited on 6 February 2019, at 06:01 (UTC).